938.25, 936.50, 935.50, 934.75, 936.50 - those are the closing prices over the past 5 trading sessions. I realize the market is at an inflection point and really wish it would make up its mind already! With the recent price action, I'm afraid to buy break-outs and almost as afraid to short break-downs (refer to yesterday afternoon's 50% retracement back up). My goal today was mostly to stay out of trouble on contract rollover day, and to get into a rhythm with my trading, i.e. 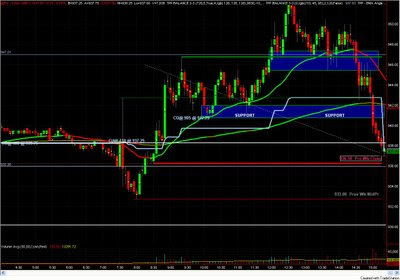 get comfortable entering/exiting trades on the Live account. I may have over-done it, but I placed 27 trades today (6 on the ES and 21 scalps on the NQ). I don't usually trade the NQ but I keep a 5-min chart of NQ up to get a feel for sector participation on big moves. For example, ES was trading above it's 1st hour high in the afternoon session while NQ was trading below it's 1st hour high. I began scalping the NQ just to get comfortable entering/exiting the market, and the NQ doesn't really do much damage since it's a smaller contract. I ended positive on the NQ and ES but broke even on the day after commissions. 1. I'm slowly getting a little better at executing trades with less hesitation. Still a looong way to go! 2. I added to a winning position in the NQ. 3. I was down $140 or so in the early afternoon and could have called it a day, but continued pressing on and made back the loss. The main negative point from today was that I didn't hold on to my winners. I was short in NQ from 1503-1507 several times but after a few 2.5pt stop-outs, I got a little shy and started taking quick winners to get back to positive territory. I was short in the ES at 844.50 and 845ish late afternoon but didn't hold it long enough because I was afraid they would run it back up like they did yesterday. Considering ES was above it's 1st hour high till 2:25 PM (central), there was a chance that price could rally back into the close. It also bounced off the 945 area so many times. Overall, I'm still down $267.50 on the week. I have to run some errands tomorrow so will only be trading the first couple of hours. Hi Awais, I was wondering what you thought of the Al Brooks book you are reading. 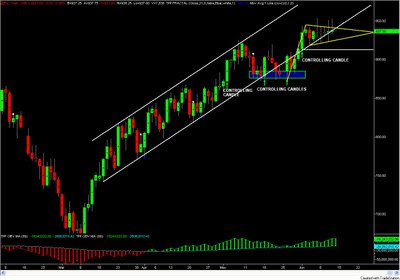 Is it relevant to daytrading with tic charts? I haven't bought any books for a long time because it seems I see the same old stuff all the time now. I know you watch 610 tic charts. Is that book giving you any "aha, now I see it!" moments? Hi Chuck, I'm only about 27 pages into it so it's a bit early to say. I found the chapter on Barb Wire to be helpful. Aside from that, so far it has been a great read since it's written by a trader, from a trader's perspective so everything he writes is very practical, as opposed to theoretical. I would recommend the book! I'll post a review on the book once I've finished reading it.